In a crowded marketplace, apartment buildings in the D.C. area can stand out by offering bike amenities that complement the region’s improved bike lanes and trails and rapidly increasing ridership. The District — recently named the fourth-most-bike-friendly U.S. city by Bicycling Magazine, up nine spots in just one year — and Arlington County are both leading the way. Nearby areas including Fairfax County are learning from those examples and developing plans to become more bike friendly, too. I'm quoted as agreeing with the statement that in the suburbs "You often have to drive your car somewhere to bike." While bike conditions aren't great in burbs, there are many bike-freindly streets and trails near where most people live. The first and last miles of many trips can be the worst because we don't have a connected network. Riding from home often does require riding on roads with no bike facilities, but unless the road is a major arterial, skilled cyclists can navigate most of these streets without too many problems. I guess the main point is that it should be easier for everyone from 8 to 80 to be able ride from home to our destinations. That's the goal of the County Bicycle Master Plan. It will take political will to make it happen. The transformation of Tysons from a car-dominated place to a more bike- and pedestrian-friendly place is mentioned in the article. There are major battles currently being fought to ensure that the excellent Tysons Plan is implemented. It won't be easy but with the transformation Tysons will be a better community, better able to compete with surrounding jurisdictions like Arlington and Alexandria. Thanks to Ann and Douglas for organizing a very successful FABB Happy Hour at Coyote Grill in Fairfax City. We had a great crowd that include several folks from the Fairfax City area, a BikeArlington Forum group who rode in from Arlington, and several FABB regulars. The seating on the patio worked out well although we could have used fewer chairs and a little more standing room. It was a good opportunity to meet some new area cyclists and find out about some bike local routes. We'll get a chance to check out some of those routes on Saturday at the FABB Social Ride. Kerie and I rode from Reston. It took about an hour. Our route included the W&OD Trail to Vienna where we took some neighborhood streets to the end of Tapawingo Rd where a short trail connects to the Nottoway Park trail to Vaden Dr. We crossed over I-66, gloating just a little when we saw that traffic standing still in the westbound lanes. We took a right on Saintsbury Dr, crossed Blake Lane to Five Oaks Rd to the end where there's another short connecting trail to Plantation Parkway which leads to Fairfax Blvd/50/29. Traffic was backed up so we took the wide sidewalk to the strip mall where we took a left at the light at University Dr and headed into Fairfax City and Coyote Grill. We'll definitely be holding more Happy Hours in the future. Thanks to everyone who came and thanks again to Ann and Douglas for doing a great job organizing the event. DC.Streetsblog writes about the new Transportation Bill. America Bikes posted an Analysis of the new Transportation Bill—Map-21. Velo-City Global 2012 "is the world’s premier international cycling planning conference. The four day event offers delegates from around the world a chance to share best practices for creating and sustaining cycling-friendly cities, where bicycles are valued as part of daily transport and recreation." FABB's Fionnuala Quinn's paper entitled "How to Speak to Engineers: Creating a Guide for Bike Advocates" was selected by the conference organizers. The talk is based in part on her work producing the Guide for Reviewing Public Road Design and Bicycling Accommodations for Virginia Bicycling Advocates. Her talk was scheduled to be given yesterday, and we hope it went well. Once we have a copy of we'll post it here. U.S. Senator Barbara Boxer (D-Calif.) and Representative John Mica (R-Fla.) have been negotiating over the past week. Transportation Enhancements (TE) has been a top point of contention, with the House demanding that states be able to shift the money to roads and bridges instead of dedicating it to trails, bicycling, walking and other TE eligibilities. From our perspective, this is the central debate point in the conference. The relative silence regarding Safe Routes to School and the Recreational Trails Program also concerns us. Our assumption, based on previous House positioning, is that the former is endangered and the latter is safe. Persistent rumors in Washington and Rep. Mica’s district office staff both indicate that the House has prevailed, to our detriment, on the issue of dedicating TE funds despite the fact that the House was not able to pass their bill that reflected this view (H.R. 7). Unsubstantiated intelligence suggests that the mechanisms to achieve this undermining of the integrity of TE may be to make it very easy for state DOTs to opt out of the program completely, transfer more money away from TE, and include expensive new eligibilities that are out of step with its purpose. Some of these same tactics were used in the Senate committee bill to maim TE, but the current negotiations may go even further. Current talk of “roadside enhancements” also raises suspicions that current TE eligibilities that occur outside of the right-of-way of highways would not be eligible. H.R. 7 took this approach, eliminating rail-trails, railroad depots, historic preservation and other important TE categories. Cyclists will likely be asked to contact their Congressional representatives to oppose cuts to the Transportation Enhancements program. Stay tuned. The Fairfax Bicycle Master Plan is in the final stages of development. The plan Bicycle Advisory Committee met on June 13 to discuss some of the proposed recommendations and review the draft bicycle route network maps. The final plan should be available the end of July. Cyclists can review and comment on the draft route maps until June 30. There are four map quadrants covering the county. The pdf files for each quadrant can be downloaded from the project website. To send comments use the bicycle plan contact form. We're summarizing our notes on the current status of the plan and will include them in the next version of the FABB newsletter due July 1. When: Saturday June 30, 9:00 a.m.
What: Anywhere you need to go in Fairfax City, a bike trail or bike-friendly street is not too far away. Fairfax Advocates for Better Bicycling is sponsoring a social ride for WABA members to share ideas about transportation cycling while enjoying a leisurely ride through Fairfax’s parks and neighborhoods. We will navigate a gently rolling 11-mile loop, returning to our starting point in time for lunch at one of the eclectic restaurants that make Old Town Fairfax a favorite bicycling destination. There is no cost for the ride (lunch is on your own tab). WABA Members only (for insurance reasons). Helmets required. Free Registration on Eventbrite. FABB is holding a Happy Hour at Coyote Grill in Fairfax City on Thursday, June 28 starting at 5:30 p.m. Coyote Grill is located on 10266 Main Street. It's a block away from Oasis Bike Works and the City of Fairfax Regional Library. Stop by and meet some of the FABB folks. We'll have some surprise treats to hand out as well. We usually have little social time during our regular meetings so this is a good chance to get to know each other better. It's also a chance for fellow cyclists who don't attend FABB meetings to join the discussion. The event is open to everyone. Hope to see you there. See also info on the FABB Events page. The Tysons Committee of the Fairfax Co Planning Commission is finalizing their work on the Tysons Plan changes. The plan was approved by the Board of Supervisors in early 2011. During that time the Board asked the Planning Commission to address several issues related to the redevelopment of Tysons, which included 1. Financing of infrastructure, and 2. Providing interim commuter parking at the Metrorail stations. I wanted to clarify and expand on my comments at the Tysons Strawman public hearing held last night, June 21. 1. Table 7, Tysons Neighborhood Spot Improvements, Bicycle and Pedestrian Access Improvements, $77M - I am concerned that Bicycle and Pedestrian Access Improvements are combined with the Neighborhood Spot/Intersection improvements. I have seen the list of 19 recommended improvements but have not seen cost estimates for those improvements. I suspect they are significant. I suggest breaking out the bicycle, pedestrian, and spot improvements so that the estimated cost for each item is known. 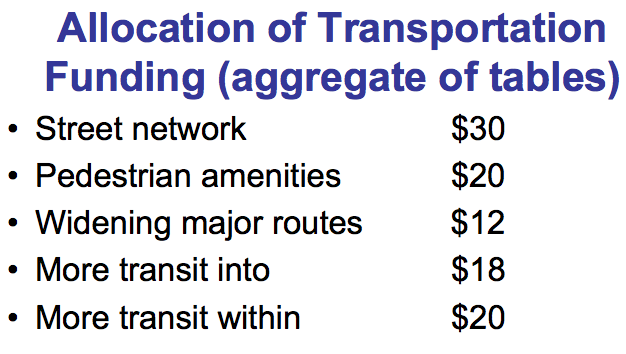 It is my fear that the cost of the intersection improvements will consume the vast majority of the $77M allocation, leaving little for bike/ped. When you consider that 10% of all trips in the DC metro area are taken by bike and walking, and that the total amount spent on all of the other transportation improvements is estimated to exceed $2B, the small amount left from the $77M will not be equitable. 10% of $2B is $200M. A fair share for ped/bike facilities is justified. I served as a member of the Tysons Task Force. We conducted a number of public outreach meetings over the 5 years. We asked participants at public meetings in the summer of 2007, which included task force members, representatives from property owners and business owners, residents, and others, to decide how they would allocate $100 of transportation funding. 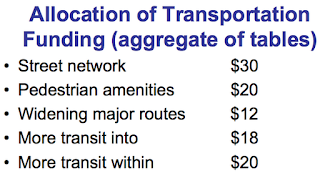 This was the aggregate result: Street network: $30, Pedestrian (and bike) amenities $20, More transit within: $20, More transit into: $18, Widening major routes: $12. It's clear that what is reflected in Table 7 contains a much different allocation of resources. I think it's worthwhile to consider what the public said they wanted when you make the final decisions about how transportation funding in Tysons should be allocated. 2. Tysons Corner Consolidated Transportation Impact Analyses (CTIAs), Line 463 - Last night when I referenced a presentation on CTIAs, it was from a Board of Supervisors Transportation Committee CTIA presentation on May 8, 2012. Slide 14 shows no bike facilities on Chain Bridge Rd or Dolley Madison. While I do not think every street needs dedicated bike facilities, the larger roads that provide key connections into Tysons such as Chain Bridge and Dolley Madison, need bike facilities. During the Bicycle Master Plan meeting in McLean earlier this year one of the most frequent comments from participants was the desire for safe, convenient bike routes to the Metro stations and covered, secure bike parking. 3. Tysons Corner connections to the Dulles Toll Road, Line 263 - I am concerned about the financial and environmental impact of these connections, especially the Boone Blvd ramp from the Toll Road that will greatly impact Old Courthouse Spring Branch stream valley park and the old Ashgrove Lane ped/bike connection to Tysons. I think the existing Route 7 exit ramp could be modified to add a connection to Ashgrove Lane by providing a cut through for exiting traffic just after the toll booth, behind the Sheraton. See an arial image of this location. I don't feel that a costly, high speed exit is needed if the goal is to disperse traffic exiting the Toll Road to the new grid of streets. 4. Interim parking - I feel strongly that providing interim parking goes against the spirit of the Tysons Plan. It is also contrary to basic transit-oriented development principles. We need to plan for good access to the future stations using transit, pedestrian, and bicycle connections, not interim parking. I also agree with a comment made earlier in the meeting that a dedicated bus lane should be included in the Route 7 widening from the Toll Road to Reston Parkway. I agree with the other aspects of the Strawman document and will continue to advocate for more funding for transit, pedestrian, and bicycle projects in Tysons when I testify before the Commonwealth Transportation Board as I have done in the past. Line 372, insert "to" between "able provide." One of the arguments we use for creating safer, more convenient bicycle facilities is to give residents more options. We've been saying that young people are driving less and using transit, bikes, and other options. This article in Good magazine, Young People are Driving Less-And Not Just Because They're Broke, is a good summary of some of the reasons for this trend. I didn't get my driver's license until I was in college. I spent my high school years in England and used public transportation almost exclusively. I hadn't yet discovered the benefits of bicycling. I took the bus to school and when I needed to stay late, I took public transit home. We traveled by train throughout Europe. In London we walked and rode public transit. It was the natural, convenient way to get around because the infrastructure was there. I didn't miss driving; I didn't even think about it most of the time. It was only upon returning to the U.S. that I needed a car, especially after trying to rely on public transit for a while and constantly being late to work and appointments. It took a couple of more years living here before I discovered that traveling by bicycle was probably the best option. Many of today's youth seem to have come to the realization that there are options to getting around other than by car. It's probably not so much the case in Fairfax because we don't have good bike facilities or convenient public transportation unless you're commuting to work in DC during rush hour. Yesterday I attended an all day training session at the Annandale NoVa campus. There are bike lanes on Wakefield Chapel Road which lead to the campus, but I saw only one bike besides mine parked in the grill racks in front. There was an ocean of parking available. From the south, getting to the bike lanes is a challenge and from the north, the only entrance is via Route 236 with no side path or bike lanes. FABB had a full contingent of volunteers at Tour de Fat yesterday. We greeted cyclists at the ID/Wristband station located across from the crazy bike pit where cyclists tried to ride laps on trick bikes. We not only had a great time but we also raised some money for FABB. Four of us met in Vienna at 7am and rode about 25 miles to Yards Park for the morning shift that began at 9am. We parked at bike valet provided by the folks at MORE. All volunteers received free t-shirts and two tokens for New Belgium Brewery beverages. New Belgium, makers of Fat Tire Ale, sponsored the event which raised funds for WABA, MORE, and FABB. After the parade cyclists returned to the main Tour de Fat area at Yards Park not far from Yards Stadium where the Nats were playing the Yankees at 1pm. There were activities happening throughout the park including the tire toss, Le Tigre performances, the bike pit, life-size Jenga, and performances by acts including Mucca Pazza, Ian Cooke, and Yo-Yo People. There was also a craft area, displays by various bike-shops and organizations, food stations (although by the looks of the long line there needed to be another hot dog vendor), and of course several flavors of New Belgium beers. Here's a short video of some of the action at the bike pit. It gives you a good feel for what the event was like, with lots of laughter heard in the background. Did we say we had a great time? Let's hope Tour de Fat returns to the DC area next year. Congratulations to WABA and especially to Nelle, WABA's events person, for doing such a great job organizing the event. And thanks to the great folks from New Belgium Brewery for helping promote biking and supporting bike advocacy in the DC area. What Are Those Bike Symbols in the Road? Shared Lane Markings, usually called sharrows, are starting to appear on roads in Fairfax County. They consist of two chevrons pointing forward with a bicycle symbol below. Sharrows are used to indicate to cyclists where they should ride in the road. They are placed away from parked cars so cyclists will avoid the dreaded "door zone." Sharrows also let motorists know to expect bicyclists in the road. Some motorists are not aware that bicyclists have the same rights and responsibilities to use the road as do motorists. Where there are no on-road bicycle facilities, bicyclists and motorists must share the road. If the road is too narrow to share, less than 14 feet, then cyclists should ride in such a way that motorists are not tempted to share the lane with them and pass dangerously close. In these cases, sharrows are placed closer to the middle of the lane. Another bike-related sign is appearing in Fairfax. The Bicycles May Use Full Lane sign sends the same message as the sharrow, that bicyclists belong on the road and on narrow roads they have the right to full use of the lane. These signs were recently installed on Beulah Road on a route between the W&OD Trail to/from Tysons. They also appear on a short stretch of Idylwood Road on a route between the W&OD Trail and the Pimmit Hills area. We can all share the road. Most cyclists avoid busy commuter routes but sometimes those are the only roads for reaching their destinations. While motorists may be slowed briefly behind a cyclist, the delay is usually minor in the whole scheme of things. Until there are safe, direct bike facilities for cyclists in the county, sharing the road is the only other option. BikeArlington has developed an excellent graphic of safety and courtesy tips for all road users. It shows various road markings and what they mean. 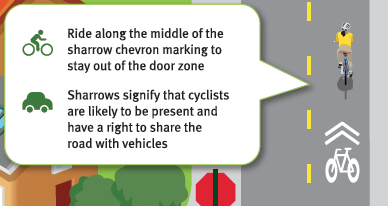 The above sharrow graphic was extracted from that publication. This article was cross-posted on Reston Patch. Christina Saindon is a physical education teacher at Centreville High School. A few years ago her school received a $5,000 grant from the Virginia Department of Education to buy bicycles for use in PE classes. I met Christina at the Bike Safety Education meeting that was part of the Bicycle Master Plan process. I was intrigued by her bike program and she agreed to answer some questions. She also sent these photos. I teach 9th grade although I will take some students from other classes in 10th grade on occasion. We have 35 students per class and I teach 4 sections each year. Although if I can get a full class set of bikes for next year I want to try to teach twice that amount. Are students required to participate or is the class an elective? It is required for my students. However, they and their parents sign an agreement to participate. If a student really doesn’t want to ride I have them help in some other way. We have about 22 bikes. Although I am looking to acquire more and sometimes students bring their own in from home. Absolutely! We require all students to wear them at all times. Students also have the option to use their own. I use the Bike Safety Curriculum from Oregon. It’s a few years old and geared towards middle school students, so I am looking for newer material. This is only my second year teaching biking. What's the name of the teacher who taught you to teach the class? Misty Boyd, Physical Education Department Chair at TC Williams (She is a BikeSmart instructor). Do you ride off school grounds? The first few days we practice drills on campus. Then we ride around Braddock Park and eventually Braddock and Union Mill Road trails. Have you ever heard of the prohibition against bike riding in FCPS schools? No I haven’t. Special Education students bike all the time. So far I have had no injuries of any sort. Many schools throughout the United States teach biking. As long as they are taught the proper guidelines and take it seriously – it’s very safe. I can see the concern however with going out on the road with such a large group. Do you think that students who go through your class are better drivers when they get their license? I doubt they are better drivers. However, it does give them an advantage going into driver’s ed classes. It also helps them respect bicyclists on the road better. Thanks to Christina for agreeing to answer my questions about the program. I hope she's able to get a full contingent of bikes for next year. 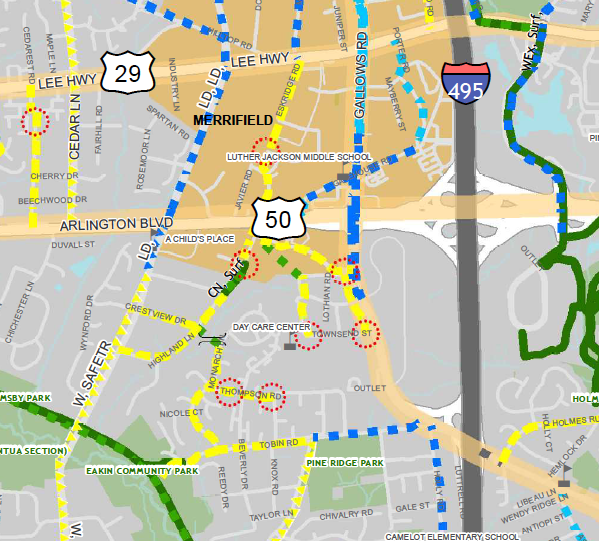 The draft bicycle route network being proposed by the Fairfax County Bicycle Master Plan team is now online and available for review. 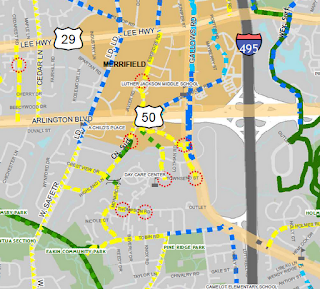 We encourage everyone who are familiar with the needs of cyclists in Fairfax to check out the areas you know and see what you think about the proposed routes. Over the past year the planning team has gathered information from cyclists around the county. They've used information from the Bicycle Route Map, mostly determining how to fix the Less Preferred routes. They traveled throughout the county documenting bike conditions and determining what facilities are needed. The bicycle plan advisory committee will meet on Wednesday to discuss the network and the policy and program recommendations. We've only seen a rough outline of the policy and program recommendations. Even though this is the last planned advisory committee meeting, we expect the dialog between the committee and the planning team to continue through June and July. Public comments are being accepted through June. You can send comments through the project website or to FABB at chairman@fabb-bikes.org. Mark your calendars for the first FABB Happy Hour on Thursday, June 28 starting at 5:30 p.m. Coyote Grill is located in Fairfax City on 10266 Main Street. It's a block away from Oasis Bike Works and the City of Fairfax Regional Library. Stop by and meet some of the FABB folks. We usually have little social time during our regular meetings so this is a good chance to get to know each other better. The event is open to everyone. Hope to see you there. See also info on the FABB Events page. 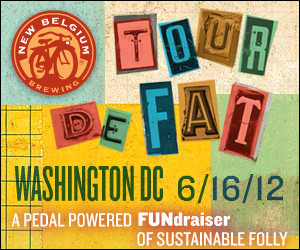 Tour de Fat comes to DC! Tour de Fat is coming to Yards Park Saturday, June 16th. If you've never experienced Tour de Fat it's hard to explain the event. It's a bike extravaganza sponsored by New Belgium Brewing, makers of Fat Tire Ale. The event is a full day of fun bike activities starting with a bike parade, costumes preferred. The event will be held at The Yards Park on the banks of the Anacostia River two blocks from Navy Yard Metro station and Nationals Park. Several FABB members are taking advantage of the bike valet and riding to the event, where we'll be volunteering at the ID/Wristband station. Why not join the fun. One of the nation’s most popular outdoor activities gets its stamp of approval today from the U.S. Postal Service with the issuance of the Bicycling Forever stamps. The four stamps feature a young child just learning to ride with training wheels, a commuter pedaling to work, a road racer intent on the finish line and an airborne BMX rider. Bicycling also is an efficient and affordable means of transportation. These days, increasing numbers of people ride their bikes to and from work or use them to run neighborhood errands. Many travel organizations offer cycling tours, from leisurely half-day jaunts to weeks-long excursions. No matter how long the ride, choosing to bike rather than drive cuts down on traffic congestion, fuel consumption and vehicle emissions, which benefits the environment and helps improve air quality. It's good to see bicycling represented on stamps that will be widely circulated. However, the "commuter pedaling to work" sure looks like a long-distance touring cyclist. You don't see many commuters with touring road bikes with front and rear panniers. I would say about 75% of the cyclists I see have hybrid bikes, including most commuters. Le Cirque du Cyclisme is a three day event "Celebrating vintage lightweight racing and touring bicycles and the artisans and craft persons carrying on the traditions. The event is held at the Best Western hotel in Leesburg. It includes daily rides, presentations and workshops, a swap meet, and bicycle show. Air Force Cycling Classic - Events include the Clarendon Cup races for amateurs and professionals on Saturday, the Crystal Ride and Crystal Cup on Sunday. The final Bicycle Master Plan public meeting was held last night (Wed.) in Annandale. About 40 cyclists learned about the proposed bicycle network and other recommendations. Most people had attended other bike plan meetings. During the meeting Cindy Engelhart, VDOT NoVA District bike coordinator, noted that that due to new legislation (see 15.2-2223, item B.4. ), any changes to the county Transportation Plan must be approved by VDOT. This would delay approval of the plan since VDOT has 90 days to submit comments. The current goal is to have the bicycle plan approved by the end of this year. An audience member asked about the possibility of a bond referendum to fund bike improvements. The answer was that some projects are being funded by the 2007 transportation bond and another transportation bond is planned. However, we think a bike-specific bond would be feasible. Why not ask residents if they would support a bike projects through a bond? Results of the earlier survey were discussed. 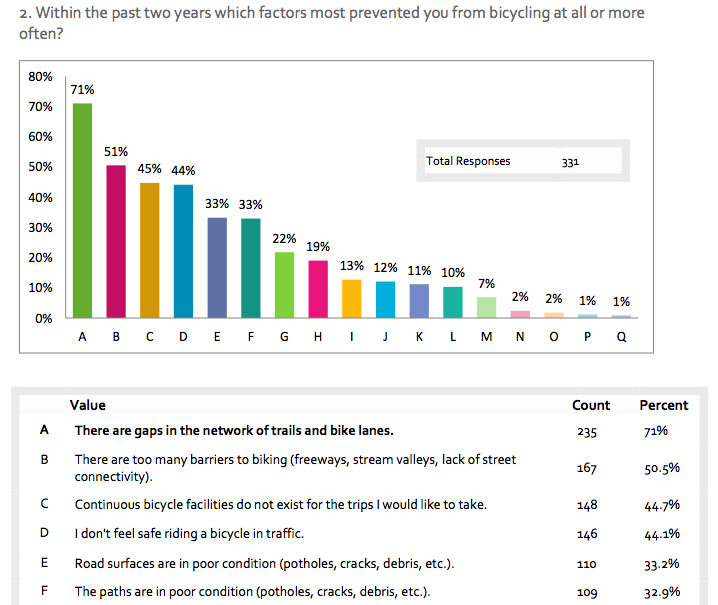 In a report of the Tuesday meeting we mentioned the top reason that people say keeps them from biking. The graph on the left shows the top six reasons. It was pointed out that the top 3 reasons, gaps in the bike network, barriers to travel, and continuous facilities don't exist for local trips, all relate to gaps in the system. 1. Form a countywide bicycle advisory committee. 2. Begin a trail maintenance program. 3. Focus attention on the VDOT resurfacing program. 4. Strengthen the existing bike program. 5. Launch a law enforcement initiative. 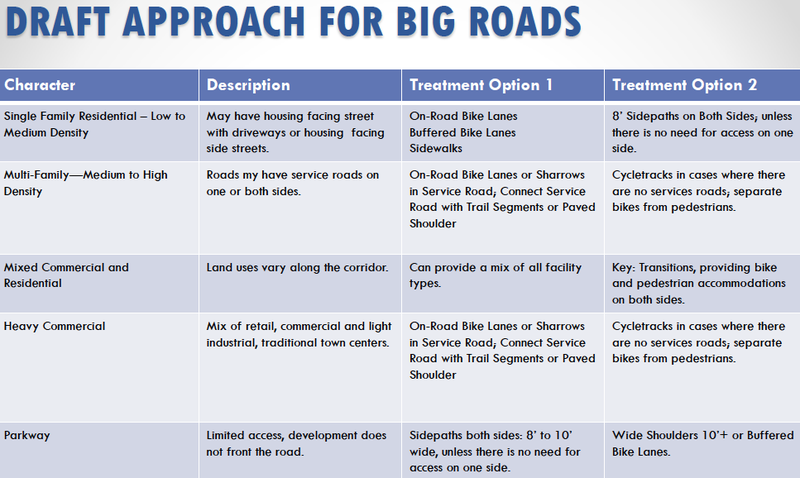 I think the most controversial recommendation is the treatment of what are referred to as "Big Roads." These are the major arterials such as Routes 1, 7, 50, 236, Braddock Road, etc. These are also the roads that create major barriers for most bicyclists. Most bike-friendly neighborhood streets don't connect to destinations. They feed into the big roads which have very few connected bike facilities. The off-road connections usually have many conflict points. Well-designed cycletracks are a good solution but are costly to implement and usually require additional right of way. 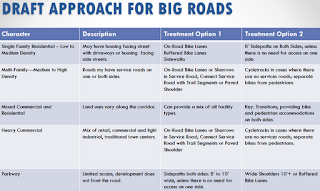 The recommendation for these roads is a table of possible treatments based on surrounding land use. Our concern is that unless the county holds to a strict policy of requiring the most appropriate facility, some developers may only implement the most low-cost solution. It could also be difficult to have a continuous, consistent design if there are options. There will likely be much discussion of this recommendation at the BAC meeting next week. The next step in the process is for the Bicycle Plan Bicycle Advisory Committee to discuss the recommendations at our June 13 meeting. While the committee has previously seen most of the route network, the public meetings were the first chance to learn about the policy recommendations and the top initiatives. We'll need to discuss them at length, review the public meeting feedback, and develop a consensus. Update: See the Fairfax City Patch article on the meeting, Cyclists Make Suggestions to Bike Master Plan. - BMUFL signs and sharrows provide similar guidance to drivers, with a few distinctions. For example, we believe that sharrows may be preferred adjacent to parked cars to better advise cyclists to stay out of the door zone. - Both devices cost about the same to install, but they have different life expectancy. Signs will last for at least a decade, but sharrows will be constantly pummeled by traffic since they’re often directly in vehicles’ wheel paths. As such, we are concerned that sharrows may need to be refreshed frequently, which obligates us to ongoing maintenance. We are closely monitoring the sharrows on Westmoreland to see how they hold up under traffic. - It is our initial hope that in most cases, we can achieve a significant benefit with either the sign or the marking, without installing both. This strategy will allow us to address (at least) twice as many sites for the same cost. Certainly there may be critical sites where both devices are needed and add value, and we will definitely consider doing so. With this in mind, we elected to focus our initial deployment of sharrows on locations where there is a gap in or terminus of an existing marked bike lane. In these areas we have already made a commitment to maintaining pavement marking expressly aimed at cyclists, and the sharrow acts to extend the markings through the gap or beyond the terminus. We focused our initial deployment of BMUFL signs on locations without marked bike lanes. The results of nearly two years of work on the Fairfax Bicycle Master Plan were presented last night at the Reston Regional Library. 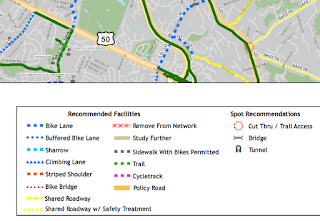 Fairfax County unveiled the proposed bicycle route network along with program and policy recommendations for making Fairfax a better place to bike. The goal of the plan is to increase bicycle use for transportation, especially for non-commute trips, which are about 75 percent of all trips. All residents, from 8-80 (or 8-90 as Joe Stowers suggested last night), should have a safe network of trails and on-road bike facilities that connect cyclists with major destinations. According to a survey conducted as part of this process, the major reason people don't take short trips by bicycle is because of gaps in the network of trails and bike lanes. I'll state the obvious. When people can safely bike to local destinations they are much more likely to travel by bike. Over the past year the bicycle plan team held eight public meetings around the county to hear from cyclists about where bicycle facilities are needed in their area. (See a summary of comments from the area meetings). In additional they held focus groups on topics such as the connection between bicycling and health, law enforcement, bicycle safety education, school transportation, and the economic impacts of bicycling. Some of the highlights of the plan in Reston include creating safe, convenient bike connections to the Wiehle Ave and Reston Parkway Metro stations, bike lanes in the Reston Town Center area, and extending the Lawyers Road bike lanes in both the east and west directions. Participants at the meeting last night ranked a list of 18 suggested bicycle initiatives. Among the top choices were: Strengthen the current Bicycle Program with additional funding and staff; Create an organization to encourage more people to travel by bike similar to BikeArlington; Provide new funding for working with VDOT to create bike lanes and paved shoulders; and Create a Countywide Bicycle Advisory Committee. The plan will be completed in July. Comments can be made until June 30. After completion of the plan, workshops explaining the recommendations will be held with the Planning Commission and Board of Supervisors, with the goal of holding public hearings and final approval of the plan the end of this year. Then begins the real work; implementing the plan and finally making Fairfax a better place to bike. The group I chair, Fairfax Advocates for Better Bicycling (FABB), advocated for the plan and members have been working with the county and consultant, attending all of the public meetings, and representing cyclists on the Bicycle Plan Advisory Committee. We'll continue that work to ensure the plan is implemented and does not sit on a shelf and gather dust. To learn more about FABB visit fabb-bikes.org. This article is cross-posted on Reston Patch. Bicycle Master Plan Meeting - North county - Learn about the proposed bicycle master plan recommendations at a public meeting at the Reston Regional Library starting at 6:30 p.m. This is one of two public meetings that will give cyclists an opportunity to learn about the plan and provide valuable feedback before the plan is finalized. The South county meeting is tomorrow in Annandale. For more information on the project see the Bicycle Master Plan website. Route 1 Public Hearing - On the proposed widening of Route 1. The meeting starts at 6pm at Hayfield Secondary School, 7630 Telegraph Road, Alexandria, VA 22315. According to Allen Muchnick of Virginia Bicycling Federation: "This segment of US Route 1 is a desired alignment for four long-distance bicycle routes: US Bike Route 1, the Adventure Cycling Association's Atlantic Coast Route, the East Coast Greenway, and the Potomac Heritage National Scenic Trail." "Therefore, first-rate accommodations for ALL types of bicyclists--including experienced, long-distance roadway cyclists--are critically needed in this project. While a 10-foot sidepath and 14-foot curb lanes are both currently proposed for this project, the proposed on-road bicycling space adjacent to 50+ MPH traffic is inadequate." "Please submit a written comment asking for 15-foot curb lanes, each ideally striped as an 11-foot travel lane beside a 4-foot wide bike lane (to the left of a 2-foot wide concrete gutter)." Written comments should be sent to Jack.VanDop@dot.gov by June 29, 2012. Tonight we rode to the Transforming Tysons Open House to check out the latest information on bicycle projects in Tysons. The meeting was held at Westbriar Elementary School off Old Courthouse Road on the outskirts of Tysons. The route we used from Reston included the W&OD Trail to Clarks Crossing Road to Beulah Road. This section of Beulah is about 1/4 mile but it's a narrow, busy commuter route and there is just a very narrow paved shoulder. The road now has a sign that tells motorists that Bicycles May Use Full Lane. The biggest problem encountered on this stretch is harassment by motorists. Now they know that we belong on the road and I'm hoping they show a bit more patience. This is a busy bike commuter route leading into Tysons and the signs are a welcome addition. From Beulah Rd we continued to Trap Road, Gelding Lane, Bois Ave, Montmorency Dr to a trail that connects to Palm Springs Dr to Hidgon Dr to Pine Valley Dr. These are all quiet neighborhoods streets and it was a very pleasant ride in the cool 70 degree weather. We arrived early so we could check out another location nearby where signage is needed. Old Courthouse Rd has bike lanes for a short stretch that end at the Vienna line. Where they are needed most is further east where the road narrows and is uphill, in front of Freedom Hill Park. We've mentioned the need for sharrows (shared lane markings) on this section in the past. They were included in a list of candidates for either sharrows or Bicycles May Use Full Lane signs. As you can see from the photo on the left looking east toward Freedom Hill Park, VDOT has marked the spot where sharrows will soon be installed. There are plans to add paved shoulders to the road in the near future. We've also heard there are Bicycles May Use Full Lane signs on Idylwood Rd, another road we've suggested needs the signage. We've already heard that someone has requested that sharrows also be used. The traffic and cyclist harassment is so bad on that section that we agree that both the Bicycles May Use Full Land and sharrows are needed. Good things are happening in Fairfax. New bike lanes on Gallows Road into Tysons, and sharrows and Bicycles May Use Full Lane signs appearing in several places around the county. With the completion of the bike plan, this might be the start of a new chapter for bicyclists in Fairfax. There are now bike lanes on Gallows Road from the W&OD trail into Tysons. The project has been in the planning stages for many years and is now mostly complete. Bike lanes now extend from just north of the I-66 bridge at the Dunn Loring Metro station to Tysons near Madrillon Road. It was disappointing to see that the bike lanes end before Old Courthouse Road. Ideally they should be extended beyond Route 7 into the heart of Tysons but that wasn't part of the project. However, we had understood that the lanes would reach Old Courthouse Road so we'll check with the county to find out if there are plans in the near future to extend the lanes. The speed limit on Gallows is 35 mph but motorists appeared to be driving much faster when we were there this morning. The bike lanes appear to be 4 feet wide not including the gutter pan. We'd prefer they were 5 feet wide given the high speeds on the road. One huge advantage of the bike lanes is that during rush hour, when traffic is backed up, cyclists can easily pass stopped traffic in the bike lanes. This is a big step forward for the county. The bike lanes are a visible sign to motorists that cyclists belong on the road. Thanks to the county for finding the funding for the project and to VDOT for adding to the bike lanes in Fairfax. We look forward to the appearance of more bike lanes, especially in the Tysons area as it redevelops with the arrival of Metro. In fact, the lanes on Old Courthouse Road are very wide and there is a wide center turn lane. It would be very easy and relatively inexpensive to restripe the road to add bike lanes, at least from Gallows Rd to Route 123.
begin the ride to the bridge. Several FABB members attended the official opening of the Pohick Stream Valley Trail that connects the Burke VRE station with Burke Lake Road and the Burke Village Shopping Center. It also connects several Park Authority and Burke Centre Conservancy trails. It will provide access to and from the VRE station for many residents in the area. A group of cyclists rode from the VRE station to the new bridge at Burke Lake Road where a group was gathered to hear speakers including Fairfax Co Board Chairman Sharon Bulova and Braddock District Supervisor John Cook. The speakers pointed out the importance of providing residents with opportunities to get out of their cars for making short trips by bike. One of the stream crossings along the trail is a fair weather crossing. Even though the weather was fair, the heavy rains yesterday meant that streams in the area were very high; so high that the fair weather crossing was impassable. As a result the bike convoy detoured along narrow asphalt trails leading into the surrounding neighborhoods. We crossed one very slick wooden bridge and a couple of riders took a spill. Not so fair weather crossing. The project was the result of cooperation between Fairfax Co DOT, Fairfax Co Park Authority, and Burke Centre Conservancy. The Park Authority has a good reputation for building trail bridges quickly and at a reasonable cost. A similar cooperative project was responsible for the Wolftrap Rd bridge that is now used heavily but the community including kids riding to Kilmer Middle School. Congratulations to everyone who helped make the trail a reality. The Tour de Fairfax is a 10-mile loop ride in Fairfax City. Meet at Van Dyck Park upper pavilion. No RSVP needed. The ride starts at 10 a.m.
Pohick Stream Valley Trail Ribbon-Cutting—Join a ride from the Burke VRE station to the ribbon-cutting ceremony for the Pohick Stream Valley Trail. The group will meet at 9:30 a.m. and will depart the station at 9:40 a.m. and arrive at the bridge in time for brief ribbon cutting ceremonies slated for 10 a.m. The bridge is located at the end of Burke Road, adjacent to the Burke Village II Shopping Center, 9570 Burke Road, Burke, VA. The ride is approximately 1.5 miles. For more information, call the Park Authority Public Information Office at 703-324-8662.